The UAE’s annual literary extravaganza, the Emirates Airline Festival of Literature, begins tomorrow (March 1) with a packed programme bringing the brightest and best writers, thinkers and creators to Dubai. Tolerance, Sustainability and Future Worlds, including the impact of AI and Globotics, are just some of the burning issues under discussion, with the Festival theme ‘United by Words’ informing many of the sessions. There is contemporary fiction of all kinds, from romance to crime, fantasy to domestic noir, plus the hottest YA writers and a brilliant programme for children including lots of fun family events and the Festival Fringe showcasing drama and music from schools and community groups around the region. Non-fiction topics cover memoir, history, science, exploration, well-being, business leadership and more. 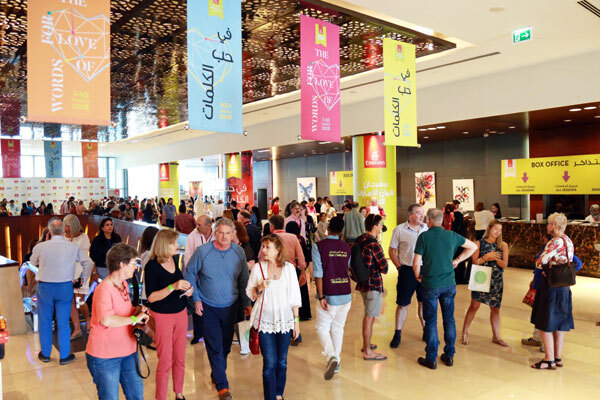 The Festival takes place at the InterContinental Hotel, Dubai Festival City from March 1-9. “We have more than 175 authors from around the world participating at the festival this year, representing more than 30 nations worldwide”, said Ahlam Bolooki, festival director. “The programme is breathtaking in its breadth and scope, with something for everyone, no matter where their interests lie. All ages, all tastes, book lovers and those who don’t regularly read can look forward to being part of the conversation over the next nine days, awakening their imaginations, indulging in culture, discovering new ideas, and making stories happen." The exciting line-up includes author of the Pursuit of Happyness, Chris Gardner, whose real-life rags to riches story was portrayed by Will Smith in the hit film; one of the most influential media celebrities in the Arab world, Ahmed AlShugairi; world-renowned ballerina and Strictly Come Dancing judge Darcey Bussell; Jane Hawking, whose best-selling memoir of her marriage with genius Stephen Hawking was turned into the film, Travelling to Infinity; IPAF winner Saud Alsanousi; Diary of a Wimpy Kid author Jeff Kinney; novelist and artist Douglas Coupland, who defined Generation X; master of crime fiction Ian Rankin, and many more. Special events include a ‘United by Food’ dinner celebrating the ways we are all connected by words and food; the return of the Festival’s atmospheric landmark event Desert Stanzas; and The Murder Mystery Dinner featuring legendary DJ Tony Blackburn giving you the chance to channel your inner Poirot. Former private secretary to Nelson Mandela, Zelda La Grange, a white Afrikaner who grew up supporting apartheid in segregated South Africa, is featured in the inspiring list of speakers along with historian Peter Frankopan, who examines how the interconnected world of today has been defined by the history of The Silk Road, and Ashis Ray who will speak about his critically acclaimed investigative book Laid to Rest: the Controversy over Subhas Chandra Bose’s Death. The programme has a host of wellbeing sessions to help find the way to health, happiness – and your own limitless potential. Business leaders can hear the latest thinking on business and leadership and the critical issues that will impact the way we run our companies. There will be a glimpse of what the future holds with world experts and futurists on consumerism, technology and globalisation. The festival’s children’s programme features a host of interactive sessions and workshops in Arabic and English covering mystery, mayhem and mischief with a cast of characters featuring The Wimpy Kid, Bee Boy, The Demon Headmaster and more. The outstanding YA programme brings amazing writers including Victoria Aveyard, Holly Black and Cassandra Clare to Dubai. Family-focused sessions cover football, mountain-climbing, animated film, anxiety, special needs topics and a fascinating guide to teenage guide to life online. There is plenty of fun to be had at the free family events – The Fringe, Family Oasis, AlMajilis, and the Penguin Random House Story Corner. As part of the Beyond Tolerance strand, a recording booth at the Festival, courtesy of audiobooks company Storytel, will record festival visitors’ words of tolerance, enabling them to actively engage with the theme. The best contributions will be included in a LitFest audio file which will be available to download from Storytel for free. Inclusivity is a key component of the festival. Most sessions have simultaneous translations and some sessions are signed for the hearing impaired. There will also be an installation from the Dubai Audio Library and the Roads and Transport Authority (RTA), in collaboration with the website Bookshare.org. The Dubai Audio Library targets seven million visually impaired people in the Arab world, and this will be the first time that the process of how books are turned into audio will be on display. Every year, the Emirates Literature Foundation Board of Trustees recognises the major contribution of an individual towards fostering literacy, education and a love of literature in all its forms. This year, Abdul Ghaffar Hussain will be presented with the Emirates Airline Festival of Literature 2019 Festival Personality Award at the celebration event on March 5, in recognition of his outstanding philanthropic achievements.